Fantastic Beasts: The Crimes of Grindelwald is number one when it comes to what moviegoers are most excited about seeing this fall. 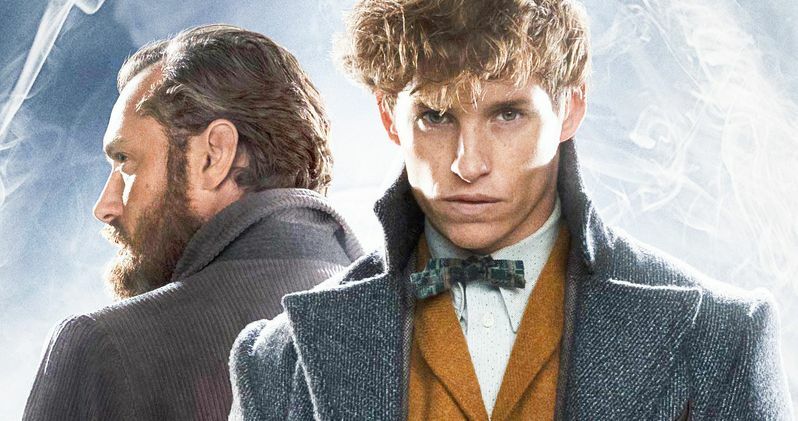 A recent survey asked more than 1,000 audience members what Fall 2018 movies they were looking forward to seeing this fall season and Fantastic Beasts: The Crimes of Grindelwald came out on the very top. It's not surprising that something related to the Harry Potter franchise would be causing such excitement, especially with Jude Law set to introduce his version of a young Dumbledore in the follow-up to 2016's Fantastic Beasts. Fandango Managing Editor Erik Davis had this to say about the survey. "Featuring a vibrant mix of exhilarating original stories and the return of hotly-anticipated franchises, this fall season will deliver movies for fans of every genre. Moviegoers are particularly excited about the long-awaited return to Hogwarts in 'Fantastic Beasts: The Crimes of Grindelwald,' as well as a double-dose of movies driven by music, with 'A Star Is Born' and 'Bohemian Rhapsody' poised as prominent awards season contenders." The long-awaited Queen biopic Bohemian Rhapsody, which stars Rami Malek as Freddie Mercury, came in at the number two spot. Just behind that is Sony's Venom, which stars Tom Hardy as the famed Spider-Man villain, who is being billed in this movie as an anti-hero. The hope is that Sony will be able to kick off their own comic book movie universe using the various Spider-Man characters they have the rights to. There's certainly interest there, as indicated by this survey. If the movie is actually good, they may be able to pull it off. Rounding out the top five are Wreck-It Ralph 2: Ralph Breaks the Internet and A Star is Born, which stars Lady Gaga and is directed by Bradley Cooper. Lady Gaga also topped the most-anticipated actresses list from the survey for A Star is Born, followed by Cate Blanchett (The House With a Clock in Its Walls), Jamie Lee Curtis (Halloween), Keira Knightley (Colette, The Nutcracker and the Four Realms) and Claire Foy (First Man, The Girl in the Spider's Web). The actors list was topped by Rami Malek. He was followed by Tom Hardy and Eddie Redmayne, who returns as Newt Scamander in Fantastic Beasts 2. The list was rounded out by Bradley Cooper for his work in front of the camera in A Star is Born and Michael B. Jordan for Creed 2. The survey also took a look at the season's most-anticipated horror movies. Not surprisingly, Blumhouse's Halloween came out on top. It's been a long time since we've seen Michael Myers and this looks like it could be the movie horror fans have been waiting for. That was followed by Shane Black's The Predator, which arrives next month and looks to rejuvenate the franchise, with The Nun, the latest spin-off set within The Conjuring universe, coming in at the number three spot. The horror list was rounded out by the upcoming Suspiria remake and J.J. Abrams WWII zombie movie Overlord. You can check out the full lists of the most-anticipated fall movies for yourself below. This survey was conducted by Fandango.